I received a free copy of the book through Making Connections from Milda Harris in exchange for an honest review.This is an innocent, YA sleuth story. As with the first book, it had some almost Scooby Doo elements to it, although not quite as strong as Adventures in Funeral Crashing. I would be comfortable recommending this for Jr. high age and up. It's like a cross between Sweet Valley High and Nancy Drew, but set in current day. I found this second book of the series to be very consistent with what I would expect after reading the first. It was charming and youthful, in addition to being a very quick read. There were some elements, as with the first book, where Kait would get a little fixated on something and repeat herself throughout the book. In the first, it was the peanut butter banana milkshake. In this book, it was the 'are we boyfriend/girlfriend', 'does he like me' or 'like me, like me?'... you get the idea. But instead of getting frustrated with the fixation (well, maybe a teeny weeny bit at first) I found it to be an endearing quality of Kait. I found her to be absolutely true to her age and maturity level which was such a nice contrast to the increasingly more 'adult' YA books that are popular nowadays.Overall, I found it to be a sweet, cute, quick little read that was just plain fun. I am eager to get my hands on more titles written by Milda Harris because I love her youthful voice that rings so true in the Funeral Crashing series. If you are a fan of more tame (no hanky panky)YA books then I would check out this series! I received a free copy of this book in exchange for an honest review.This is the second book in the Funeral Crashing series and its every bit as good as the first. These books are both fun reads and great read together or each can be stand alone novels. This one picks up immediately where Adventures in Funeral Crashing left off but if you haven't read it that's ok because you get caught up along the way. Kait is a strong female character who isn't a popular girl in school and she is fine with that. She knows that she is different but is happy with who she is. On her first official date with Ethan, which happens to be homecoming, the festivities are interrupted by murder. She can't resist the sluething bug to find out what happened.This is a wonderful book full of great characters, sweet love interests, humor, and adventure. Its a mystery full of twists and turns and an ending that I didn't completely see coming. This is a great young adult mystery that I would recommend to anybody that likes a fun read with great characters and a mystery to solve. Reviewed on Lili Lost in a BookThis was another fun mystery with Kait, the Funeral Crashing Graveyard Girl, in this series that is definitely starting to become one of my favorites! This time, girls at her school are being murdered and it’s up to Kait (and Ethan!) to figure out what’s going on before someone close to her is targeted too.As before, I loved the quirky Kait and the oh-so swoon-worthy Ethan! I also loved watching the Kait-Ariel dynamic. It’s so sad seeing how that friendship ended. I wonder what happened there... Hmmm. Speaking of friends, she gets help from friends, yay! Kait has always been a loner, until now! And I loved seeing all these different relationships she is forming.There was another rambly bit at the beginning which is great if you’re not binge reading these one right after the other... like I did. However, this had another crazy-good mystery! I cannot deny how amazing it was! I SO did not see that revelation coming! Funeral Crashing is a very promising series! It’s just so much fun, has great mysteries, interesting characters, and a super cute romance! I cannot wait for more! 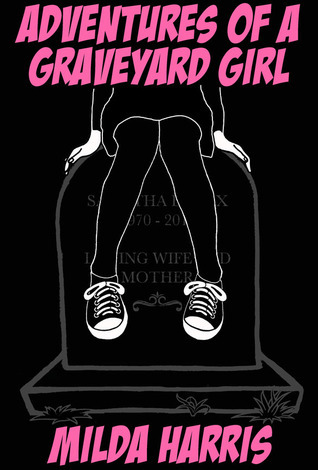 Adventures of a Graveyard Girl is entertaining and absorbing. Many of Kait's negative experiences at high school echo moments that have happened to a great part of the population. Those incidents make having Ethan by her side a daydream come true while at the same time she worries about what she really means to him. Murders are apparently another element in her life. This time around, the teenage sleuth and her sidekick, Ethan involve some of their friends to help solve the deaths of two of their classmates. While the writing is pretty good, there were quite a few mistakes in spelling and punctuation, including some omissions. Loved the story and the continued adventure and murder/mystery involved. Great writing that keeps you intrigued and wanting more. Originally published on my blog.Wow, a third DNF review in so many weeks. I know this makes me look bad, I do, but I swear things are not as bad as they seem. I only have thirteen books marked a DNF on Goodreads. I probably have a few more I didn't mark, but no more than twenty, twenty five - in three years of over 470 books. That's a pretty good percentile, don't you think? I don't DNF that often, or that willingly. At least, I didn't use to.But I think I've also reached the point where I treasure the enjoyment I get from every book, and if I don't really enjoy it... well, there isn't much point in reading it, is there?Still, I don't always review DNF books... Only if I can explain exactly why I didn't finish it, and I'd like to share that.I picked up this book because a while back (like, two years ago), I read the first book and enjoyed it. It wasn't A-mazing, but it was cute and fun and I decided I wanted to continue with the series. But then I couldn't. At 48% of the book, I called it quits. My heart just wasn't in it. I kept looking at reading the book as a chore, which is never encouraging.I had three big issues with Adventures of a Graveyard Girl.1. It was way too... dare I say it?... childish to me. I don't need characters to be my age to enjoy them, but here they just read like immature 12 year olds, and not teenagers. And I've read and enjoyed books with twelve year old more than this. It was just... too exaggeratedly childish. Teenagers are allowed to have their immature moments, for sure, but not 100% of the time.2. Then there was the poorly edited text. There were a lot of missing punctuation marks, or places where I felt a dot should've been but weren't. There were a lot of duplicated words in a way that made no sense. A lot of describing sentences that lacked finesse. It felt like... well, like an amateur job. Like no one actually read over the book and corrected all of these. It was like reading a draft, and not a finished product. And I don't know about you, but that bothers me.3. And finally, the repetition. How many times can you say the same thing on one page? apparently, a lot. Enough that I totally lost count. It was like Harris didn't trust we got the information the first time, so she mentioned it 50 times more just to be sure. In very similar wording. That's one of my major writing pet-peeves.So in the end, despite enjoying the first book, I decided this is as far as I and this series go. It's just not for me, really.Originally published on my blog. Adventures of a Graveyard Girl is an incredibly super cute and comical murder mystery. It's a lot of fun to read, the characters are engaging, the plot is cleverly written, and the romance is sweet and charming. The twists and turns, that Milda Harris throws out at readers are unexpected and interesting making the book that much more enjoyable. It's the perfect blend of mystery, suspsense, and romance. The situations and the writing is incredibly realistic and makes it easy to connect with the characters and find them likable at best.Kate is a really amazing and fun herione to get to know. Who doesn't love a character that gate-crashes funerals? It's refreshing to see how much more confident she is in her own skin and how she doesn't really care what others think of her. She's encouraging, intelligent, and strong. It's interesting to see her navigate around the clues, piecing them together, and trying to solve the murder of a young girl killed in the bathroom. She has her own style and approach to things, which can be a lot of fun. The romance between Kate and Ethan is sweet and charming. It was delightful to see how well they connected and realistic their relationship was presented. Readers will find themselves just as excited for their first date, as Kate was until things took a strange turn, and a little bit of murder and mayhem in the girl's bathroom takes place. They're just full of so much energy that it will definitely have readers rooting for them. The murder mystery, rumors, and panic surrounding the death of a girl their age in the bathroom, was handled very well. It was definitely compelling, full of suspsense, and the right amount of panic. There's so much wonderful creativity and originality that this book has going for it, that it's a ball of awesome for anyone who is a fan of both chick-lit and murder mystery. If you put the two together, then you have the absolutely perfect light read for the summer. FYI: Book #1 is free on smashwords and B&N, and amazon! :)Be sure to go get it and watch to see if the 2nd one goes for free as well!Being around 150 pages, this was a shorter read for me. I honestly read so many books in a month I have no idea how I keep the plots straight. For example, now I am reading Hunger Games#2, the new Sookie Stackhouse book, 77 Days, and another one about a vampire. I think this is because my mind is so used to doing 15 things at once that it needed something to make up for it and boy did I! Adventures of a Graveyard Girl is a YA book, which I love. I'd love to see a study done that shows the actual ages of people who read YA books - I bet anything that more adults do than the YA themselves! One of the things I always look at to decide if I like a book is the cover - yes I know, Don't judge a book by it's cover, but I do! It looks like the character is going to be a goth girl because maybe she hangs out in the graveyard. I like making predictions because it gives me a reason to read as well as making me feel good when I was correct!Kait is literally the girl who you went to school with that was quiet at times, but unbelievably funny. I like to think of myself as never quiet and always funny, so the main character and I did have a little in common. The way the author writes and gives emotion to the characters is like a breach of fresh air, with a tinge of dark humor. I would definitely recommend this book to readers of all ages, especially if you have teenage girls who just received a Ebook Reader! I loved how the book was a mystery, yet included a lot of elements that high school age kids can relate to - puppy love, dances, curiosity, and fitting in. Better yet, this is part of a series and I love them! Its been a long time since I read a Young Adult book and Adventures of a Graveyard Girl did not disappoint. Starting on a great note, it weaves in the murder towards the beginning of the story making for a suspenseful read from start to finish.The connection between the Graveyard Girl and her interest in solving murder mysteries is very well brought about. Even being unpopular in school for crashing funerals, she manages to get together with one of the most popular, good looking boys in school - Ethan. While being part of a series, this book is easily read alone on its own. However, it did make me want to read the first book after I completed this one.The mystery kept me guessing till the end and I did not want to put it down because I got so involved in it.Targeting Young Adults and teens, the book did not make for heavy intense reading, yet kept the thrill alive. The backdrop of the school and teenage problems is something that will relate to this audience.Well written with a superb plot, this book is highly recommended. Adventures of a Graveyard Girl was an entertaining, and enjoyable read that I was really glad to have taken the time to read. It had me laughing in places, tearing up in others and simply sympathising with the characters and all of the high school dramas that they were dealing with. It was fun and quirky and Kait is definitely someone who can be used to show that being who you are is much better than conforming to who they want you to be. It has a great message within the story and I feel that there are many other readers who will really enjoy this novel. I would recommend this book to teenagers between thirteen and seventeen but feel that some older readers may appreciate the book as well.To read a longer, more detailed review, please click here to head over to my blog post. I'm many years out of high school so I feel I have the "right" to use the word adorable lol. That is exactly what Kait Lenox is! She's an adorable, extremely likeable and easy to relate to main character that any woman any age will find herself falling in love with. Kait's million mile a minute inner voice keeps the story moving at a fast pace and keeps the reader on their toes. The clues to the mystery are doled out at just the right pace to leave the reader guessing to the very last moment. In this book Kait faces her second murder mystery, this time set within the walls of her high school. Mystery and sweet tennage romance make for a great quick read that you won't be able to put down. I could not put this book down! It was fast paced and entertaining. The way Milda took these book characters on another ride for their lives was very interesting. What I liked most about this book is the way no matter what happens Milda has wrote this with my two new favorite characters (Kait and Ethan) that they don't care what people think about them and keep pushing until they get the job done. Kait and Ethan continue their teen sleuthing in the second book in this series. As the death toll grows Kait is worried that her ex BFF Ariel is next on the killers list and she must discover the killers identity before someone else dies. This book is as action packed and funny as the first and I highly recommend! This was an awesome book. If you like mysteries and books that keep you wanting to read I suggest you read this book. It was a gripping story of a teenager who crashed funerals and wanted to investigate the deaths. A great follow up to the first book. Love the characters. Love the premise. The author manages to capture the frenetic mental looping of an adolescent brain without our heroine sounding whiny. I really like these books I would read them again and again! This one was just as good as the first one in the series. Can't wait to read part 3! Cute, quick read. Perfect for a young teen. Accurate depiction of high school kids, except for the murder. I really did like it, but I felt like I was reading "popularity is all you have in high school" over and over. Another fun readOnce again it was a terrific and fun story. A!l ages will enjoy this book as we!l as the others in this series about Kait and her murder solving friends. Whatever age you are, this is another cute read by Milda Harris in Book 2 Adventures of a Graveyard Girl: (Funeral Crashing Mysteries #2). It is an enjoyable, easy read that keeps you on your toes in trying to guess who the culprit could be. Kait is a smart and quirky character who has an interesting perspective on crashing funerals. I’m glad I found this author and this series. The story had good twists and turns, and some touching moments. I especially loved the scene between Kait and her ex-bffs mother. I could actually imagine that playing out in real life. Needs editingIt would be a fun read if there weren't so many misused words and grammatical errors. Why isn't anything edited anymore? I really really love this series. Best YA mystery series. This book was even better than the last. Milda Harris - MILDA HARRIS has a dog named after a piece of candy (Licorice), was once hit by a tree (seriously), and wears hot pink sunglasses (why not?). She is the young adult author of Doppelganger, Adventures in Funeral Crashing, Adventures of a Graveyard Girl, The New Girl Who Found A Dead Body, and Connected: A Paranormal Romance. She also works in production on television shows like Austin & Ally, Hannah Montana, and That's So Raven.